Originaly a medieval farmhouse, it was converted into a spacious residence by Willem van de Goudt (Steward of the States of Holland) in 1533. The farmhouse's cellars can still be seen in the basement. In 1595 Noordeinde Palace was purchased by the States of Holland for Louise de Coligny, the widow of William of Orange and her son Frederick Henry. He enlarged the house in 1640, known then as the Oude Hof. He bought the surrounding plots of land and the architects Pieter Post and Jacob van Campen oversaw the alterations. These included lengthening the main building and adding wings creating the characteristic H-form that we can see today. 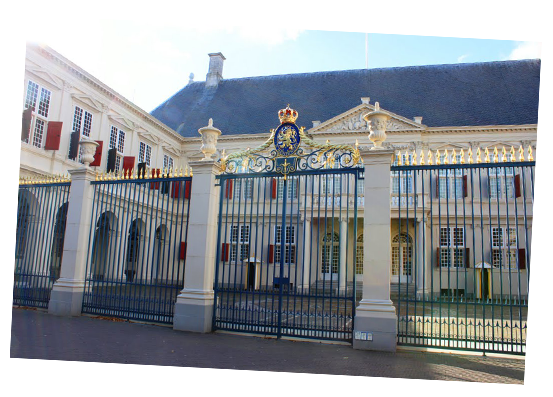 After the death of this governor in 1647 his wife Amalia van Solms moved into the palace. The son of William V, who would become King Willem I, took up residence in 1792. But when Napoleon invaded the Netherlands in 1795, during the French Revolutionary Wars, he and his family were forced to go to England. The Palace Gardens are open to the public but closed for security reasons during state visits. In 1984 a major restoration was again completed and you can see when the King is in the Working Palace as the flag of The Netherlands is flown above the Palace. King Willem-Alexander has not moved that far since he was only the Prince as he used to only live next door !